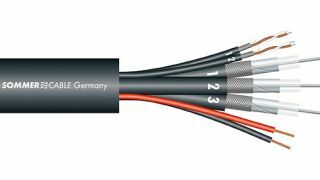 The What: Sommer Cable has introduced the new Transit MC 3202 HD, a video/audio and camera control combo cable that meets and surpasses the requirements for 4K and 8K Ultra-HD transmission applications. The What Else: The new UHD-SDI hybrid cable joins three UHD video (BNC), two digital audio (three-pin XLR), and a camera power supply line (e.g. four-pin XLR) in one compact cable, and complements already-existing Sommer fiber-optic combo cables. "Whether at large events, in remote recording trucks, or in studio installations, Ultra HD is gaining ground everywhere," said Pascal Miguet, product and sales manager at Sommer Cable. "Compared to Full HD, the exponentially higher resolution often poses a challenge when connecting broadcast production equipment such as cameras, monitors, and editing consoles. With that in mind, Sommer developed this new cable that is recommended for all applications where both a stable UHD signal transmission and compact size are important." The Bottom Line: The three-in-one cable is flexible, easy to reel, and because of its low damping values, recommended for long-distance transmissions. Customers can purchase the new cable in bulk, or premade and ready for connection. One-foot samples are available upon request.